b sq. 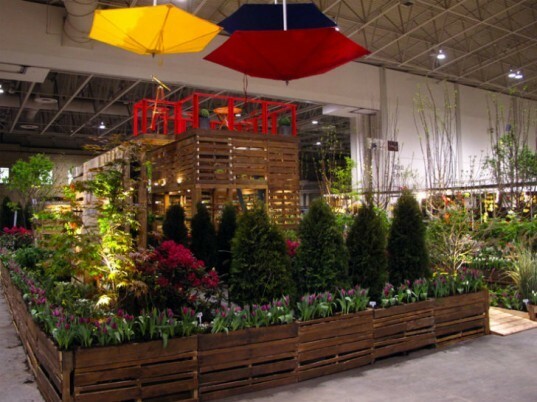 Design Studio Inc blew the crowd at the Canada Blooms Garden Festival away with their colorful garden display built completely out of shipping pallets. “Plug and Play – the Pallet Garden” features 105 standard pallets, which were used to create planters, water features, and a playhouse tower. The landscape design and build firm wowed visitors with their playful creations and showed that commonly available materials can be used to create fantastic designs. For their 5th annual installation at the 2012 Canada Blooms Garden Festival, b sq. Design Studio set out to do something a little different. They decided to take a common material, one that people see everyday, and use it to create something beautiful. The Toronto firm also wanted to show off their skills using uncommon materials and be able to dismantle projects and reuse the materials. Shipping pallets were readily available and became the building blocks for their installation called Plug and Play – the Pallet Garden. In total, the firm used 105 shipping pallets that were all 5” high, 40” wide and 48” long. They built walkways, planter walls, a 12’ high playhouse with a roof deck, a water feature and a series of freestanding pallet herb gardens. The playhouse features a counter area where adults can entertain and the structure is sturdy enough to double as a climbing wall for children to play on. Visitors were delighted with the garden and surprised when they realized it was made out of pallets. In addition to the garden, b sq Design Studio also had on hand, their 20′ mobile shipping container project office. At the end of the show, the entire installation was dismantled with the pallets returned to warehouses and the plant materials will be relocated into permanent locations throughout Toronto. For their 5th annual installation at the 2012 Canada Blooms Garden Festival, b sq. Design Studio set out to do something a little different. They decided to take a common material, one that people see everyday, and use it to create something beautiful. The Toronto firm also wanted to show off their skills using uncommon materials and be able to dismantle the project and reuse the materials. Shipping pallets were readily available and became the building blocks for their installation, Plug and Play - the Pallet Garden. In total, the firm used 105 shipping pallets that were all 5” high, 40” wide and 48” long. They built walkways, planter walls, a 12’ high playhouse with a roof deck, a water feature and a series of freestanding pallet herb gardens. The playhouse features a counter area where adults can entertain and the structure is sturdy enough to double as a climbing wall for children to play on. Visitors were delighted with the garden and surprised when they realized it was made out of pallets. The garden tower doubles as a playhouse and an entertainment space. In addition to the garden, b sq Design Studio also had on hand, their 20' mobile shipping container project office. b sq. Design Studio has used the shipping container office as their mobile support office for the past three years extending the life of this trade show display indefinitely. 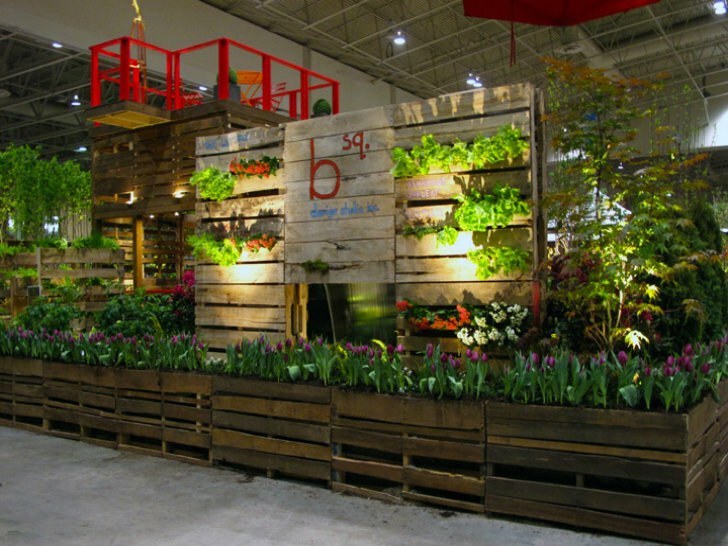 Rendering of the pallet garden.